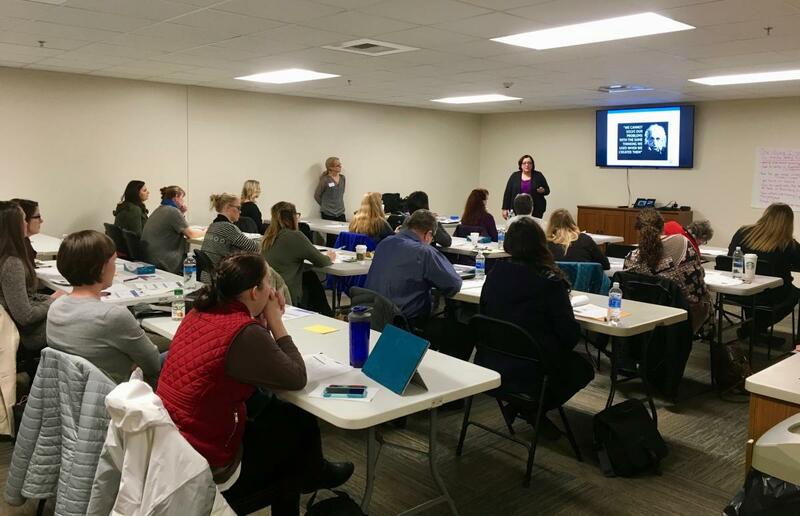 Care coordinators participate in a recent class held by the Northwest Rural Health Network. To share resources and collectively support rural health systems to develop integrated models of care. The Northwest Rural Health Network collectively contracts for and supports cost-effective, high-quality population health services in rural communities through the development of individual community capacity and innovative partnerships. Jac Davies, executive director of the Northwest Rural Health Network, was interviewed by the Network TA Team to share information on the network’s characteristics, key learnings, accomplishments, and challenges. A: We are a peer-based network of 15 rural health systems, 14 of which are critical access hospitals and one of which is not, that serve communities all across the eastern third of Washington State. Our members vary in size from serving a community as small as 3,700 to communities of over 80,000, but they all have in common a strong dedication to rural communities and rural populations. Our original name was the Critical Access Hospital Network. Our board felt that the emphasis on the critical access hospital element was less important than it used to be, because all of our members are in fact rural health systems. They're much more than hospitals. They operate clinics; they are working on a variety of population health measures in their communities. We felt it was time to start recognizing them as such, and we’ve been known as the Northwest Rural Health Network since September of 2016. A: Because we are all located in a relatively common geography, our members face many of the same challenges. Part of the reason they're members and part of the benefits they receive is facilitated collaboration and sharing of information, as well as looking for ways to share resources across members to help them be more effective at serving their populations. A major part of it is recognizing that our members have so many commonalities. Many of them are in a common referral region, with patients traveling to the same urban centers for advanced care, so it makes sense for them to collaborate and coordinate their efforts. We also do quite a bit with facilitated planning. We have committees that are working on some joint projects to see how we can, at the very least, share information so that they can each make more informed decisions. Also, we're working on some specific projects where we might be able to reduce some of their costs and improve their access to services. Q: What other types of organizations do you partner with? A: There are larger organizations, integrated health systems, that are more urban-based but with which our members interact regularly because patients may end up in the urban centers for specialty care or long-term hospitalization. While it's very important to our members to have this network be dedicated to rural interests, particularly rural health systems, we certainly want to make sure that we have good relationships and are able to work effectively with the urban systems. A: The speed and overwhelming complexity of change that is happening now in health care, particularly here in Washington State, is a challenge. It’s not necessarily unique to rural health care, but I think it's exacerbated by the nature of rural health care. There is a lot of work being driven by the Washington State Health Care Authority, which is our Medicaid agency, around Medicaid transformation. The state was actually just granted a waiver and is kicking off a large-scale project. It's a program to try and move Medicaid and the delivery system entirely to value-based payments. Of course, that's also happening on the Medicare side. Because the State Health Care Authority is also the largest purchaser of private insurance for state employees, they're using their purchasing power to drive the commercial sector as well. So there's a huge amount of pressure to move in this value-based purchasing direction, and there's all kinds of support and tools, such as the TCPI, the Transforming Clinical Practice Initiative, for example, and the ACO movement that CMS is promoting. The Health Care Authority has put out a huge number of resources to help practices with this transformation. On the one hand, while it's great that there are all those resources available, in a small rural health system there are only so many people who can access them. We’re now trying to see if we can coordinate all of these programs, or at least coordinate some of the resources, so that they’re easier for our members to take advantage of and they aren't overwhelmed by all these different groups—the state hospital association, the state Department of Health, the State Health Care Authority, the quality improvement organization, our network, etc.—everybody coming to them and saying, "We know you need to make this change. Here are some things that can be done. How can we help?" Q: On the flip side, what are the advantages of working in your rural environment? A: I think that one of the big advantages of rural in general is that because these are smaller systems and, in our case, they're all independent, they have the ability to make decisions and act very quickly. They are very closely tied into their communities, and they have the ability to really engage their communities as part of that decision-making process. I think that's a stronger connection than many urban health systems see. By and large, our members have a strong history of working together, and so there are good relationships already in place. They all understand the challenges that they each are facing. That's very helpful in trying to run an effective network. Q: Tell us about a challenging situation your network is facing. How are you working to overcome it? A: About three years ago, we experienced a period of rapid growth, when our network membership almost doubled. So, there are a number of new members in the network who were not there from the beginning. Our members are accustomed to sharing information, or at least some of them, and subsets are used to working together. However, we’re actively trying to develop some common business requirements across all members and actually going out together to try and develop specific resources. This is new for our group. It’s been a challenge developing the processes and beginning to develop the culture of collectively identifying and sharing resources in a very concrete way. Through a strategic planning process last year, we tried to identify common needs across the network. The one that rose to the top universally was behavioral health services. That need was there regardless of the size of member. So we elected to focus on that specifically as a group and have been working through a process to both qualify and quantify what our members mean by behavioral health services. When you start drilling down, behavioral health services, of course, have got a lot of complexity. We're working through some processes now to very specifically understand what that means in terms of the types of patients. Are we talking pediatric, or are we talking adults? What does it mean in terms of care settings? Is it for critical cases in the emergency department? Is it for long-term chronic behavioral health issues in primary care? What does it mean in terms of volume? How many patients are we talking about? We've set up a structured process to answer all of those questions. Once we've characterized the problem, then we’ll work together to identify some solutions. Some of our members do have behavioral health staff. Is it looking at how we might share those staff via telehealth? Or is it contracting together to some outside telehealth-based behavioral health service vendors? It's been a challenge because it's the first time this group has very concretely pursued the idea of collectively looking at a problem and identifying some solutions. They're beginning to see the power of a network through this process. It goes from being the theoretical, "Yeah, we're in a network because we can do things together," to "Here's something that we are doing together, and here's how we're doing it." Q: What keeps your network members engaged throughout this process? A: With so much other stuff going on, it's difficult for people to take the time. We're running data reports now on behavioral health encounters. Each member's running some reports to get a sense of what their volume is. All those things take time. There's just so much other stuff going on. I think patience and persistence are the two keys. It's also working to understand what the barriers are for individual members. Some of them have the IT staff and the types of information systems that basically allow them to generate a report the next day. Some of them have much more difficult processes and have to work with outside vendors. It's seeing, can we help with funding to develop a report? Can we connect them with a peer in another organization that has the same information system who can help them walk through it? It’s trying to be persistent without being obnoxious, and that's a hard balance. Q: Based on your experiences as a network leader, what advice would you give to a developing rural health network? A: Partly I'm just by nature a pragmatist, but I think it's really important to find something concrete that the members are interested in and want to work on, something that they're going to see value from. Behavioral health services are an example, which is why we're working so much on that. They all recognize it is an area of need. They all recognize the value of being able to do something together because it's concrete. The only way you can make the hard transition from the theoretical to the specific is to identify whatever those pain points are for your members and focus on those to get things moving.